Pineapples are incredibly delicious and versatile fruits with a yellowish flesh that has a fragrant aroma and sweet taste. This drought-tolerant plant grows five to eight feet tall, and the fruits have a tough, spiky exterior which is around 12 inches long and can weigh up to eight pounds. They look like large pinecones, with spikey, waxy rind, that has many hexagonal sections (fruitlet). On top, pineapples have a “crown” of thick pointed leaves with spines along the edges. What is interesting is that all pineapples have the exact same number of hexagonal sections on it, no matter their size and shape. Pineapples are rich in potassium, magnesium, copper, manganese, folic acid, and dietary fiber, as well as vitamin C, B1 and smaller amounts of B2, B3, B5, and B6. Yet, the most important characteristic of these fruits is the presence of bromelain, an enzyme that provides most of their health benefits. It maintains a proper pH balance in the body and stimulates hormonal secretions in the pancreas and thus helps digestion. This protein-digesting enzyme reduces inflammation and swelling and relieves pain. “Bromelain is a natural extract that has been found to speed healing and acts as an anti-inflammatory medication- similarly to over the counter medications like aspirin and ibuprofen. Additionally, when applied topically, the benefits of pineapple include its ability to help in healing cuts, burns, insect bites and to help dissipate bruising and other skin problems. Additionally, recent studies have shown us that bromelain from pineapple helps stop lung metastasis in its tracks, which suggests that bromelain can be used to treat a wide variety of diseases. A cough: The bromelain enzyme has potent anti-inflammatory properties that soothe pain and suppress coughs 500x better than any cough syrup. 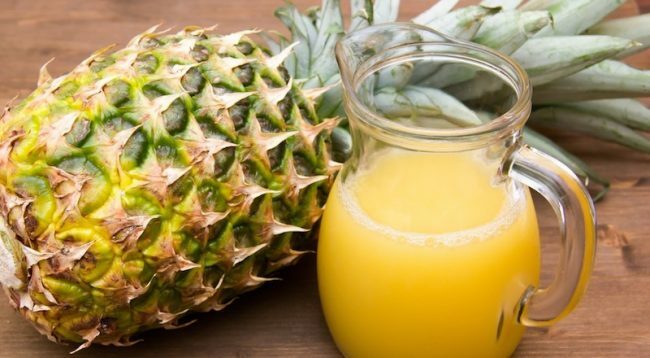 Inflammatory conditions: Pineapple juice fights inflammation, and relieves pain due to gout, injuries, carpal tunnel syndrome, osteoarthritis, and rheumatoid arthritis. Respiratory conditions: Bromelain breaks down and dissolves excessive mucus, relieving the symptoms of sinusitis, pneumonia, asthma, and bronchitis. Digestion: To support digestion, drink a glass of pineapple juice after a heavy meal. Immunity: The high vitamin C content fortifies the immune system and prevents infections, colds, and the flu. Atherosclerosis: The high amount of vitamin C prevents hardening of the arteries by protecting them from damaging oxidants. Blood clotting: Pineapple juice effectively prevents the formation of blood clots. High blood pressure: Pineapple juice is high in antioxidants and powerful blood clotting prevention properties which naturally lower blood pressure. A sore throat: Pineapple juice soothes the soreness and redness in the throat. Vision health: The high content of beta carotene protects against eye damage and diseases. Bone health: Pineapples are rich in minerals that boost bone health and strengthen the connective tissues. When purchasing pineapples, choose the heavy ones, with a nice golden color, and make sure the bottom stem does not have moldy spots. Before you eat the pineapple, you should cut off the crown and turn the fruit upside down on a plate and leave in the fridge, to distribute the sweetness from the bottom throughout the entire fruit. Cut the pineapple core in small pieces and add them to dishes, since it is full of nutrients. The cut pineapple should be kept in an airtight container in the fridge for up to a week.